Perfect for a handbag, they'll never be lost without this cute little mirror. 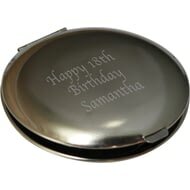 Personalise this beautiful compact mirror with any name of up to 15 characters. 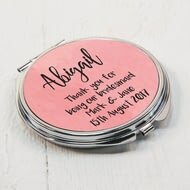 They make the perfect gift for you to thank your bridesmaids or a present for Mum. 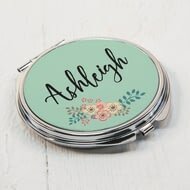 Personalise this beautiful compact mirror with any name of up to 15 characters and your unique message over 4 lines of 25 characters. 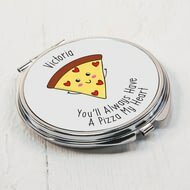 Personalise this pun-tastic compact mirror with a name of up to 15 characters. 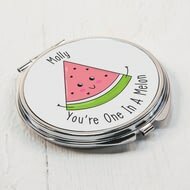 The wording 'You're one in a melon' is fixed. 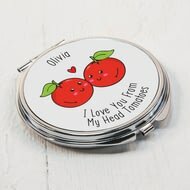 Personalise this pun-tastic compact mirror with your chosen name of up to 15 characters. The metal mirror is 7cm in diameter and is a double sided mirror on opening.